Aleksandr Popov, an oft-overlooked figure in radio history, was born in the village of Turinsk, Russia, 16 March 1859. He was one of seven children. Popov's father, a village priest, encouraged him to enter the priesthood. He attended Seminary School at Ekatarinburg, where he became interested in science and mathematics, interests that would shape his future career. Rather than continue on to Theology School, he enrolled at St. Petersburg University to study physics. He graduated in 1882, with honor and distinction, but stayed on as a laboratory assistant — a position he was offered due to his excellent record and dedication to the field. However, having a family to support, in 1883, he took a position with the Russian Navy School in Kronstadt. The libraries and laboratory facilities there enabled him to conduct the research he was most interested in. Among these pursuits was the continuance of the works of scientists such as James Maxwell and Heinrich Hertz. In 1888, Hertz proved Maxwell’s theory that electromagnetic waves could be transmitted through the air. Shortly thereafter, Eduoard Branly and Oliver Lodge independently observed the same phenomena: two metal spheres near one another would fuse when a spark occurred nearby. This crude device, which became known as the "Branly-Lodge coherer," could be used to detect the waves Hertz had shown to exist. Popov's vision was accurate, and though there is still some debate over the validity of the claim, Popov is said to have transmitted the words “Heinrich Hertz” from one building to another on the campus of St. Petersburg University on 24 March 1896. The debate stemmed from the fact that reports of this demonstration were not published until years later, and the fact that no one could speak of Popov’s work because it was for the Navy, and not intended to be public knowledge (the Navy required Popov to sign a non-disclosure statement). While Guglielmo Marconi is usually hailed as the inventor of radio, the Russian has his proponents. Decades after his death in 1906, the Soviet Government made Popov a national hero by declaring 7 May "Radio Day," a holiday which is still celebrated today. Aleksandr Popov and Guglielmo Marconi worked independently of one another. In fact, Popov had begun to move away from radio research and towards X-rays when he noticed Marconi was getting a great deal of attention for a device remarkably similar to his own — a detail Popov was not shy about pointing out in local papers and meetings with colleagues. The first Popov radio system used by the Russians was placed on Gogland Island in the Gulf of Finland and Kotka, on the Finnish coast. A battleship, the General-Admiral Apraksin, had run aground in November 1899. To coordinate the process of freeing the ship, the Russians sent a crew to set up communication. They did not arrive until January 1900, but once they were able to send and receive messages, the usefulness of this device became clear. Early into the project, a ship brought news to Kotka of fishermen stranded on an ice-floe. Kotka relayed the message to Gogland, where an ice breaker was attempting to break the Apraksin free, and within a day the icebreaker had come to the aid of the fishermen. The Russian Navy then began to take note of the importance of the new technology that Popov had been urging them to adapt for use on their ships for quite some time. On 10 January 1906, Popov passed away at the age of forty-six. The stress of a rigorous work schedule, coupled with his concern over the suppression of a student movement at his university, took its toll. 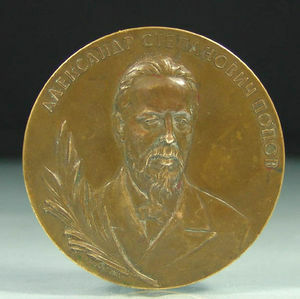 However, he is well remembered in Russia, especially at LETI, Saint Petersburg University, which proudly houses the museum his youngest daughter founded, as well as a Professor Popov Street. This page was last edited on 13 January 2016, at 17:27.